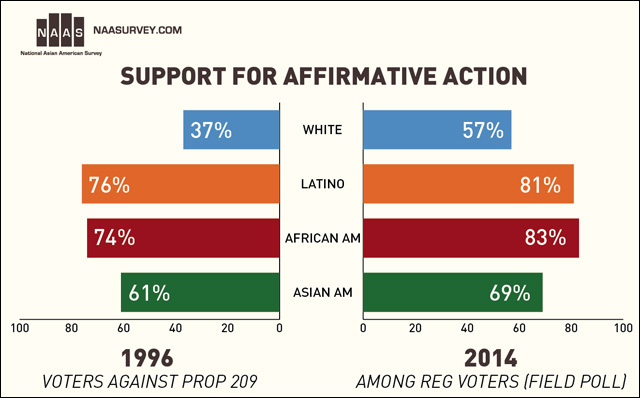 Most Asian Americans Oppose Affirmative Action? That is incorrect. Two weeks ago, my survey group released a report on affirmative action that analyzed whether Asian Americans (and others in California) were opposed to affirmative action. Turns out that, contrary to all the noise we heard in March 2014, there are more Asian Americans who support affirmative action than those who oppose them. Many more, like 69% for and 13% against, with the rest expressing no opinion. Now, this does not detract from all the activism that happened a few months ago. Without a doubt, those who staged protests, online petitions, and tea-party style town-hall meetings were successful in getting Asian American lawmakers in California to buckle. But, it is also starting to become apparent that the defeat of affirmative action was more likely the result of intense mobilization by a vocal and well-organized minority than any big shift in Asian American opinion more generally. As I've said elsewhere, the loudest people in the room are not always representative of what everyone thinks. One of those leaders didn't take too well to the survey results. Yunlei Yang from the Silicon Valley Chinese Association, which is opposed to affirmative action, published an opinion in the LAT Times "blowback" section, questioning the integrity of the research and the validity of the findings. The problem is, in trying to attack the messenger rather than taking in the message, Mr. Yang got way too far ahead of himself. Here's what he got wrong (go ahead and read his piece first). Here's my point-by-point takedown. FACT: They do not. In fact, Pew Research Center shows in a recent survey strong levels of support among whites, Blacks, and Latinos that are ALMOST IDENTICAL to the levels seen in this survey. Pew's framing on race has been problematic in the past, but their survey methodology is generally well respected as among the best in the business. By contrast, the Gallup survey (which Mr. Yang cites) has been famous for its errors, including overestimating conservative opinion, like thinking that Romney was going to win in 2012. CLAIM #2: The survey question is misleading because it combines jobs and education. FACT: If Mr. Yang had read our report closely, he would have seen that affirmative action in California prior to the passage of Proposition 209 included consideration of race and gender in public jobs as well as higher education. If Proposition 209 were fully repealed, and this is something that has been on the table in California in recent years, it would involve both jobs and education. Furthermore, this question repeats those found in prior surveys by Pew, Quinnipiac, and the 2012 National Asian American Survey. It would be impossible, for example, to assess whether the SCA-5 mobilization changed Asian American opinion on the topic without having the exact question wording. CLAIM #3: If the question was focused only on higher education, there would be no support. FACT: The Pew 2012 survey question focused only on higher education, and found majority support among whites, and overwhelming support among Latinos and blacks. It did not survey Asian Americans. 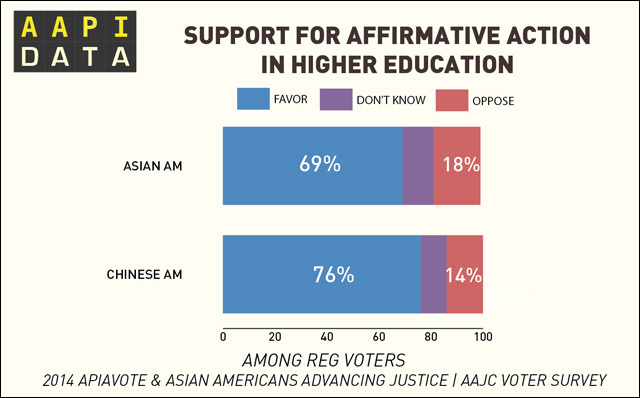 However, a new poll from APIAVote and Asian Americans Advancing Justice - AAJC shows that 69% of Asian Americans support affirmative action programs as it applies to higher education only. Support among Chinese Americans is 76%. CLAIM #4: 100,000 signatures from an online petition is indicative of a groundswell of opposition to affirmative action. FACT: There are about 6 million Asian Americans in California and 19 million Asian Americans nationally. There are over 1.5 million Chinese Americans in California, and 4 million Chinese Americans nationally. While 100,000 signatures might be impressive, and may have been effective in intimidating certain organizations and elected officials, it is by no means evidence of majority support. In fact, our survey evidence indicates that the online signature gathering effort could have gathered over 700,000 signatures from Asian American residents in California, and still be consistent with our findings from the 2012 NAAS and the August 2014 Field Poll. CLAIM #5: African Americans lose out under affirmative action, according studies by Sander and Taylor. FACT: Sander and Taylor's study has been pretty strongly discredited, and comparisons to other social science research is summarized in this law review piece. This quote, in particular, is telling: "The authors conclude that the social science research overall, and particularly the best peer-reviewed studies, do not support the mismatch hypothesis with respect to affirmative action and African American and Latino college graduation rates and earnings... The authors find that Sander and Taylor's contrary claims are the result of cherry-picked data." In academic-speak, that's a pretty hard smackdown. Speaking of smackdowns, check out this no-holds barred piece by Jenn Fang. Makes my piece above almost seem downright diplomatic by comparison. Now, why did I go through the trouble of taking on this piece? For one, it is important to have a well-informed discussion on the topic, and to know the difference between the opinion of activists and the general public. But there are other important reasons as well, and I should clarify that these opinions below are those of me personally, and not related to our survey research. 1) We do a disservice by unnecessarily driving up anxiety among Asian American communities. Asian American parents are already anxious about their children's education, and spreading misinformation about affirmative action (that it involves quotas, that it is responsible for the difficulty of getting into a UC) only makes this worse. 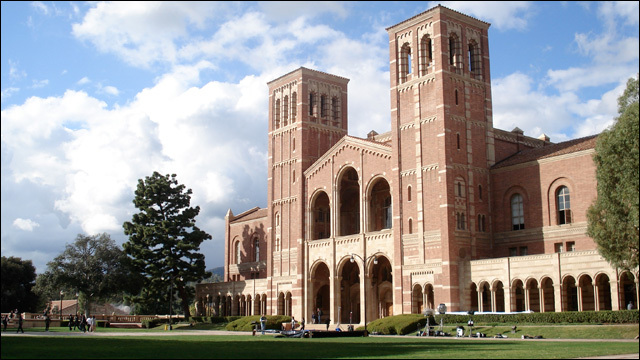 2) Focusing on racial competition distracts attention away from the biggest reason why it is difficult for Asian Americans (and everyone else) to get into places like UCLA and Berkeley: The rise of out-of-state and international students, including ironically, international students from Asia. Given how the Supreme Court has ruled recently, any return of affirmative action in California will pale in comparison to the scarcity cased by out-of-state admissions. I'm sure that others have plenty to say, including what this means for racial justice, partisan politics, and the like. My goal here is mainly to show that it is important to constantly strive to have an accurate sense of our community, and to show that distorted views of our community are problematic, for many reasons. Not the least of which is claiming to represent the community, and denouncing any efforts to try and find out what the larger Asian American community actually thinks. Karthick Ramakrishnan (@karthickr) is Professor of Public Policy and Political Science at the University of California, Riverside. You can find his academic writings at karthick.com. The views above reflect those of Prof. Karthick Ramakrishnan, and not necessarily those of the National Asian American Survey.